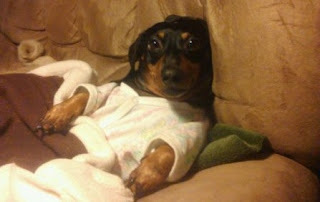 Pathetic Dachshund wishes you all a Happy Valentines, Presidents, and various other arbitrary holidays Day. Now that February is over, maybe we can all get some work done. Looking over these numbers, I have to say that I am once again disappointed in my efforts. I allowed a few writing funks that I got into to get in the way of progress. I told myself I would make it up in the past few days, but actually got caught up in reading. I finished both of The Hunger Games books by Suzanne Collins over the past 72 hours. That sort of obliterated my writing time, but I was very happy to find myself lost in a story again. It had been far too long since I holed myself up and powered through a couple of books. On the year, I am more than 10,000 words behind. I need a good month to start making up on that number, but I will try to get back to completing my daily goals. I also really need to finish Human Echoes so I can start cutting it down. It has sprawled to nearly 100,000 words on its own. Considering the genre averages, I think I might need to take it down to around 80,000. Does anyone else near obsessively track their word counts? I only have one spreadsheet right now for everything, but I feel like I should be generating a few more for individual stat breakdowns. Here’s to a better March. So do you actually commit a certain amount of time to word counts or is it all auto-generated?